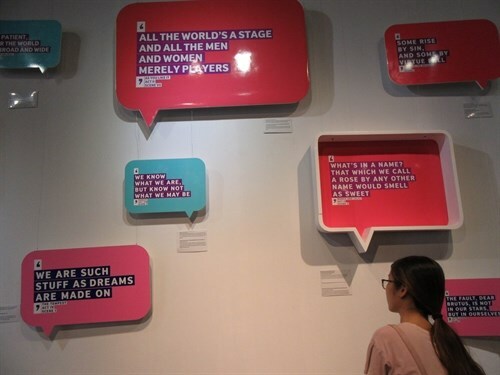 Hanoi (VNA) – Some of Shakespeare’s most famous written lines are on display in an exhibition in Hanoi until October 15. The exhibition, Shakespeare Lives in Words, is being held at the Cultural Exchange Centre at 50 Dao Duy Tu Street in the Old Quarter of Hanoi. The visitors can rediscover the style and language of the English poet and playwright, a man widely regarded as the greatest writer in the English language and the world’s pre-eminent dramatist. They include “To be or not to be”; “There is nothing either good or bad, but thinking makes it so”; “We know what we are, but know not what we may be”, “Love looks not with the eyes, but with the mind”. Giles Lever, British Ambassador to Vietnam, said at the exhibition’s opening ceremony that more than 30 quotes from such classics as Hamlet, Macbeth, the Tempest and Romeo and Juliet, and others renowned works show that the verse, though created nearly half a millennium ago, is still alive and breathing. “400 years after his death, it’s great to see that Shakespeare’s works are still enjoyed,” he said. Through installations of colours and shapes, the show surrounds and submerges audiences into a world of language. The big cut-outs display the words in differing colour screens and layouts. Broader contexts of the quotes and fun facts about Shakespeare’s life are also displayed. In addition, participants can read Shakespeare’s works in Vietnamese and learn about English words invented by Shakespeare. At the opening ceremony of the exhibition which was held on September 22, the winners from ‘Shakespeare Lives in Sonnets’ translation competition were announced. Organised by the British Council and Nha Nam Publishing House, the competition attracted more than 250 entries from across Vietnam. Competitors of all ages not only showed a genuine interest in Shakespeare but also great courage in decoding the very difficult language of Shakespeare’s 154 sonnets. “Through the contest, we discovered excellent translators. I was nicely surprised to see that translators not only translated from English into Vietnamese, but also transformed Sonnet into Vietnam’s traditional verse forms like luc bat (six-eight verses) of five-word verses. That shows that art is the bridge connecting different cultures,” said Danny Whitehead, British Council’s Deputy Director. He added that he hopes that the exhibition and the contest will encourage Vietnamese people to further discover the British literature and to stoke Brits’ curiosity about Vietnamese literature. A round-table discussion on teaching and reading Shakespeare in Vietnam was also organised to coincide with the re-print of Romeo & Juliet in Vietnam (translated version). The exhibition is part of the global Shakespeare Lives programme. Shakespeare Lives is a series of events and activities throughout 2016 celebrating Shakespeare’s work on the occasion of the 400th anniversary of the literary master’s death. Activities in English, education and the arts are expected to help the public to explore the story of how the ‘Bard of Avon’ and his work continue to inspire people all over the world. Taking a leadership role in Shakespeare Lives activities in Vietnam, the British Council has collaborated with publishing houses, arts organisations and schools to engage audiences with new creative work inspired by Shakespeare’s plays and sonnets. Shakespeare Lives activities have enabled audiences to reassess perceptions of Shakespeare and provide new inspiration to engage with his work, work that never fails to charm readers regardless of time or place./.